ADT Promotes DIFY - "Do It For You"
"Do It Yourself" (DIY) is a popular expression and has become such a common word that it has even made the Cambridge English dictionary. But why do it yourself when you can have someone "Do It For You" (DIFY)? If ADT has its way, DIFY may become just as common a term. The story had two more installments (part 2 is here and part 3 is here), in which the Golics battle it out for system-supremacy, seeing who can get the better of the other using remotely activated features like locking each other out of and in the house (the latter feature seems unlikely as it would violate life-safety laws governing free egress), adjusting the thermostat, activating the sprinklers, turning lights on and off, and playing loud and dramatic music. Searching the hashtag on Mike Golic, Jr.'s t-shirt returns 3 tweets from Twitter, 3 pictures on Instagram, and 2 Facebook posts, all featuring the tagline "Let ADT do it for you." IPVM spoke with ADT about the spots to see what the driving force behind them was, but ADT said it was not prepared to discuss the impetus for the spots nor a future direction ADT might take the campaign. The term DIY has come to legitimize the action of doing it oneself and not using a professional installer. In fact, an audio advertisement for DIY security company Simplisafe heard on the Pandora music streaming service spoofed an alarm "professional" botching a couple's alarm installation by knocking holes in walls, and falling off his ladder while hanging devices. The whole point of that spot was to say "Why have some charlatan posing as a pro install a simple wireless system for you when you can DIY? 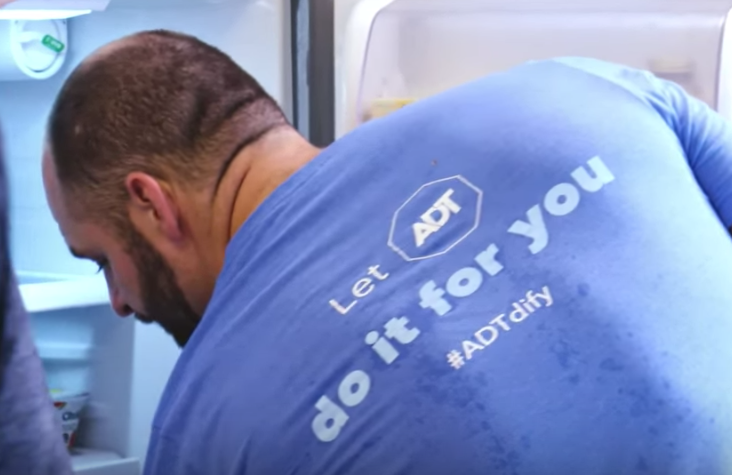 ADT's new DIFY campaign could build the muscle to fight back. To the extent that ADT and other installation companies can make DIFY a well-known term, it could help crystallize and encourage people to use a professional. Lots of companies (especially tech startups) have significant motivation to encourage DIY as a way to disrupt existing installation focused businesses. A marketing campaign and an accepted term like DIFY could make it easier for buyers to express their desire to have someone do it for them. This is a very creative and very fun series from ADT. It does a good job of showcasing the value provided by professionally installed residential systems which can integrate security and home automation solutions. The companies that are providing these types of solutions and services are helping to make lives safer, more comfortable and more convenient. Establishing any new term is not easy, indeed ADT's commercial makes just that point/joke when the term is first introduced. He just DIFY'd me? Will ADT put the marketing money behind this to make it a household word? Will other security companies support such a marketing effort? It certainly has advantages for the professional security industry and ADT, despite its stock troubles, is still a multi-billion dollar company. It is possible but they will have to invest significantly over a long-term to establish it. Comments (15) : PRO Members only. Login. or Join.